Today I’m really happy to have Tiffany Ivanofsky on the show. Tiffany is someone who I was introduced to by Toni Anderson and she is making millions of dollars selling LuLaRoe clothing. But here’s the kicker. She sells all of her inventory using Facebook Live. In fact, I’ve watched her and her husband Paul live and the way they sell is mesmerizing. Anyway, today we are going to break down how they manage to sell so many pieces of clothing live on Facebook and learn about their strategies. How selling LuLaRoe products work. How Tiffany came up with the idea of selling on Facebook live. How she created a crazy Facebook following. How her sales tactics can be applied to other products online. Steve: You’re listening to the My Wife Quit Her Job Podcast, the place where I bring on successful bootstrapped business, owners and delve deeply into what strategies are working and what strategies are not. Now today’s podcast guest has an amazing story to tell. 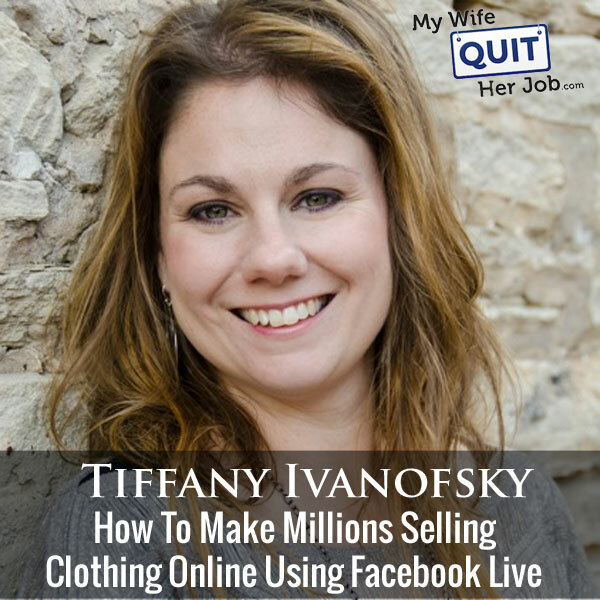 Tiffany Ivanofsky sells millions of dollars worth of merchandise broadcasting live on Facebook. So think of it like a QVC except on the Facebook platform. Anyway it’s a fascinating way to sell online, and today we’re going to learn exactly how she does it. But before we begin I want to give a quick shout out to Seller Labs for sponsoring this episode, and specifically I want to talk about their awesome Amazon tool, Scope. Now I’m really excited about Scope because it’s a tool that actually increased my Amazon sales on several listings by 39% within the first week of use, crazy, right? Now what does this tool do that could possibly boost my sales so quickly? Well, quite simply, Scope tells you what keywords are driving sales on Amazon. So here is what I did. I searched Amazon and found the bestselling product listings in my niche, then I used Scope to tell me exactly what keywords that bestselling listing was using to generate sales. I added these keywords to my Amazon listings, and my sales picked up immediately. So today I use Scope for all my Amazon products to find high converting keywords in the back end as well as for my Amazon advertising campaigns. So in short, Scope can boost your Amazon sales almost immediately like they did for me, and 39% is nothing to sneeze at. Right now if you go to Sellerlabs.com/wife, you can check out Scope for free, and if you decide to sign up, you’ll get $50 off any plan. Once again that’s Sellerlabs.com/wife. Now, I also want to give a shout out to Klaviyo who also is a sponsor of the show. And I’m always excited to talk about Klaviyo because they are the email marketing platform that I personally use for my ecommerce store, and I depend on them for over 20% of my revenues. Now you’re probably wondering why Klaviyo and not another provider. Well, Klaviyo is the only email platform out there that is specifically built for ecommerce stores, and here is why it’s so powerful. Klaviyo can track every single customer who has shopped in your store and exactly what they bought. So let’s say I want to send out an email out to everyone who purchased a certain colored handkerchief in the last week, easy. Let’s say I want to set up a special auto-responder sequence to my customers depending on what they purchased, piece of cake, and there is full revenue tracking on every single email. Now Klaviyo is the most powerful email platform that I’ve ever used, and you could try them for free at mywifequitherjob.com/K-L-A-V-I-Y-O, once again that’s, mywifequitherjob.com/K-L-A-V-I-Y-O. Now, on to the show. Steve: Welcome to the My Wife Quit her Job Podcast. Today I’m really happy to have Tiffany Ivanofsky on the show. Now Tiffany is actually someone who I was introduced to by Toni Anderson, and she’s actually making millions of dollars selling LulaRoe clothing, but here is the kicker. She actually sells all of her inventory using Facebook Live. And in fact I’ve watched her and her husband Paul live on Facebook, and the way they sell is actually really amazing, and it’s actually mesmerizing. And today what we’re going to do is we’re going to break down how they managed to sell so many pieces of clothing live on Facebook, and kind of learn about their strategies which I believe can be applied to actually any e-commerce business or any situation where you have to have to make sales. And with that, welcome to the show Tiffany, how are you doing today? Tiffany: I’m doing so great, thank you so much for having me on here today. Steve: Really happy to have you Tiffany and I just think what you’re doing is amazing, and I hope to learn a lot about your sales strategies. So first of all, let’s talk about how you got into selling LulaRoe. I know that you are into extreme couponing, you’ve been on like to Today show and TLC. How did that kind of transition over to LulaRoe? Tiffany: You know it was actually a little bit of an accident. I have a couple of VAs that work on my site for me, and my husband and I had experienced a great loss like two years ago, and one of my VAs was actually concerned about me. And for Valentine’s Day She was trying to cheer me up, and she sent me some leggings for myself and my children, and I got them and I couldn’t understand why they didn’t match, and why I couldn’t get matching leggings. And I went completely obsessed with trying to find these matching leggings. If you know anything about LulaRoe, nothing matches, and it’s hard to find coupons anything, and so I was obsessed with trying to figure out why I could not just order these online. And that kind of led to looking at this business and trying to figure it out, and then really looking even past the clothing part of it to see this incredible business opportunity that I felt like people were not realizing the value in it. And I within — I couldn’t think about anything else for 24 hours a day. And I just decided to sign up and I said the same thing to my husband. And I just, I put my paperwork in, and you actually have a little bit of a wait. And so I had a three month wait before I could even do anything. But it just, it really kind of, I stumbled into it just from a VA. I kind of recognized that business opportunity there that I felt like people were not taking advantage of. Steve: For all the listeners who might not be familiar with LulaRoe, could you just kind of describe what it is first of all. Tiffany: Yeah, so LulaRoe is — it’s truly amazing comfortable clothing. They’re all about family, but the thing that is such a draw is that they have very popular prints, and they’re very limited. And so any given pattern, they only make 5,000 of a print, and even in the clothing industry, that’s a little bit unheard of because it’s very expensive to make a limited run like that when they’re producing so much. And so the popularity is when you have a print that you love dearly, and let’s say you need it in a medium and spread out between three different styles, extra small to three XL. There’s only going to be about 225 of those mediums spread out between 60,000 consultants in the draw as you see that print and you want it, you’ve got to jump on it and grab it like that. And so that’s what makes them popular is the exclusivity and the difficulty sometimes in getting those patterns. Steve: Are they collector’s items then or no? Tiffany: Definitely some of them are, and it’s funny they call them unicorns. Tiffany: So you’re always on this – you always hunt for your unicorn. Steve: Interesting, so this is like I don’t know if this is the correct analogy, but it’s like pokerman for clothing or no? Tiffany: Yes or Beanie Babies for adults. Steve: Okay, but people actually wear the clothing too, is that correct? Steve: Okay, so you found out about this opportunity from your VA. So what is actually involved in signing up, and how does like kind of the program work? Tiffany: So well what you do is you just basically find a sponsor, you submit your paperwork as your interest in joining this company. It doesn’t cost anything to do that. And then you do have a wait in the queue. So at the time I signed up, the wait was about 13 weeks, it’s actually down to about six weeks right now. The benefit is that it’s gives you time to get ready, kind of wrap your brain around this business to prepare how you’re going to sell it, if you’re going to be able to have space to have it displayed, or if you’re going to be able to do this out of rubber maids, however you’re going to have your business set up. So you wait about six weeks in the queue, and then you’re going to get your phone call from home office, and they welcome you, and that’s when you place your first wholesale order. Steve: I think it’s that first wholesale order; I’m just kind of curious how much they made you buy. Tiffany: It’s about — there’s three different packages. We always just recommend going with that lowest package, because as soon as you’re off the phone with them, you can turn right back around and you can reorder whatever you want. So you get that package. That first one is about 325 pieces of inventory, and it’s around $5,000. Steve: Oh, wow, okay so the upfront investment is fairly significant? Tiffany: It is yes, and I’m okay with that. I actually sometimes wish it was a little bit more because you really need that amount of inventory to have a good variety for people. Steve: Do you get to pick out, like you have to go through and pick out all the stuff you want, or how does that work? Tiffany: The crazy part is, and this is the other crazy part is that you can pick your styles and sizes. They have about 39 different styles, and so you can pick from a range of that. We suggest going with probably the six to eight most popular in the beginning, and then going actually deep in the sizes. So instead of just having three in every size, if you have ten, you’ve got more variety for your customers. So we suggest about eight styles to begin with, ten of every size in the kind of building your inventory like that. So now you’re allowed to choose your styles and sizes, you can’t ever choose your patterns, which is really interesting. So when you get that box, every time it’s kind of like Christmas, like you’re opening it up, you have no idea what you’re getting. Steve: That is crazy, so how do you know that when you’re buying this kit, whether it’s going to sell or not? Tiffany: Do you know and the wild part of this and you’re going to hear this from everybody is everything sells, which is amazing. And I didn’t — at first I thought what am I going to do? And I would open a box and I would pull out a shirt, and I would be like, oh what I’m supposed to do with this? And then the funny part is, is that was the first item that would sell. And so I think what it does teach you is not to prejudge your inventory, and not to just assume that you know what everybody else likes. And that can be a little bit of a hard lesson to learn, but you realize pretty quickly the things that you think are going to sit there and not sell, and someone walks in and they’re like, oh my gosh, that’s my unicorn, I love that, I have to have it. And you’re like oh, okay then, I wasn’t expecting that. But it really teaches you to kind of have this broad; just an open mind when you’re giving everything that somebody loves it. Steve: What about deciding on like sizing in the beginning, like how do you know what size your target customer is going to be? Tiffany: You know I think you have to guess a little bit. Some of it is a little bit of a trial and error. I knew — I took a kind of a stab in the dark, and I decided that I wear about a size ten, and sometimes I don’t like going into the store to try stuff on, because you’re uncomfortable, you don’t want to go in a dressing room. But I noticed that my friends that were maybe plus sized, they really shop online at home. They don’t want to go in and try stuff on as much, they don’t feel comfortable doing that, and they kind of like the privacy of shopping at home. And so I kind of took a guess that I felt like some of those bigger sizes might sell a little better. And for us in our group they have, we sell I would say about 60% is large and above, and about 40% would be under. We carry everything; we carry every size just because I don’t want my customer to feel like we don’t have something for them. But the girls that have really focused on a niche, of course they’ve built this great community around that. Some just focus on large and above, and some just focus on smaller sizes. And so I think when you find your niche, or if you go in knowing what your niche is, I mean you kind of cater towards a little bit towards that niche, I feel like you’re always a little bit more successful. Steve: Okay so going in, you kind of made a guess about who your target customer was going to be, and then you kind of skewed your sizes accordingly to the larger sizes? Tiffany: I did and really just kind of when I knew that — I knew in the beginning I would have to some trial and error. Some people might have a better idea, but I just I wasn’t sure where I was going to go. And I took one poll in my Facebook group to find out. I thought I better do that. I mean it was kind of all over the place, I don’t feel like I got a very good, I mean got a real good answer from that. But we just started watching what we were selling, and we just went from there. Steve: Okay, so let’s now back up and kind of start from the beginning. So you have this initial set of inventory, and you primarily sell on Facebook. So this Facebook group I presume started from zero members, is that correct? Tiffany: It did in August last — I’m sorry, April last year, zero members, opened it up, and just started. Steve: That’s great; it’s millions of dollars in just a little over a year which is really crazy. So you talk about how you started that targeted Facebook group, like what was going on through your head? How did you know what type of people to attract? Steve: What is the group called first of all actually so people can look at it? Steve: Can you just tell me what the group is called. Tiffany: It’s actually Emma Lou’s LulaRoe Boutique. Steve: Okay, I’ll link that up in the show notes. Tiffany: And I invited them to come on in. I started posting pictures of myself in the clothing, and I wasn’t even really advertising the clothing. I was just posting a picture of me every day wearing one of the pieces of clothing, or just asking, do you think I should wear these shoes or these shoes with this skirt? I mean I just was getting interaction and people were interested, and then every now and then they would ask what I was wearing, and I would tell them. Steve: Were these friends or were these random people? Tiffany: Well, originally it was friends, and then they were inviting their friends and their friends and their friends. I did one giveaway in the beginning with a crazy cool pair of leggings, and told people to add friends. Again a lot of people do a lot of giveaways, I wouldn’t suggest that because you get a lot of extra in your group that don’t really want to be there, and it doesn’t help you. But I only did that one kind of giveaway in the beginning, and people just — they were just joining. They were interested in it and they were interested in posting pictures of themselves in the clothing, and I just kind of left that open for them to ask questions, post pictures of themselves. I would continue to post my pictures, and it just was growing from there. Steve: So can we break it down like how often were you posting in the beginning? Tiffany: I was posting probably about — I would do a post in the morning what I was wearing that day, I would comment on any, reply to everybody, and then I’d probably post something later in the day. I’d post a minimal recipe or just something interesting and following up. I was at least posting twice a day. Steve: So would it be fair to say that your customers are like you in terms of demographic? Steve: They are one 100% yes. They’re probably — mostly around the same age, stay at home moms, work at home, we do have a lot of teachers, nurses, yeah they definitely are. Steve: Okay, and then you are in love with the clothing and it kind of shows through in the photos that you were posting, and then your friends kind of still recommending their friends because they’re all into the same clothing, is that correct? Steve: And so you were posting it sounds like what, three times a day? Tiffany: I would say so yes. Steve: And this is just you posting, it’s not any software, it’s just you coming up with content and posting on your Facebook page? Tiffany: One hundred percent and I have other Facebook pages I’ve done where I’ve scheduled stuff out, and it was very planned and thought out. This was extremely organic, and just — I had seen someone at a park wearing something LulaRoe, I took a picture, I asked her, took a picture of her and I was talking about it, got 500 people commenting on that. It was very, very organic compared to a lot of other stuff that I’ve done. Steve: Interesting, so at what point did you start selling? Tiffany: Well, this is interesting, so typically my personality, I love to plan everything out and write lists for my lists, and I had this great amazing business plan all written out. And I had followed some of the big top who I thought were the top people in this company, and watched what they were doing, and I had this strategy of how I was going to sell this clothing once I got here. At the time I was traveling about three weeks out of every month with my job. I was teaching coupon classes all across the country for newspapers, and I was really tired of traveling, and I knew that when my inventory would come I would be gone. My husband had just — I had just kind of passingly mentioned that this inventory was coming. One day I had just left to go out of town and my inventory showed up. Facebook Live was really new, I think we had even just gotten the ability to do it on that page for that group, and I asked him I said, hey my inventory is scheduled to come today, and I was looking at it. I said when it gets there, is there any way I could get you just to open it up and live, and just show me what it was, because I want to see it, I was so excited. Steve: Okay, can we break this down, because okay so what’s funny, and this is for the listeners, what’s funny is that her husband, Tiffany’s husband Paul actually does most of the selling, wouldn’t you say? Tiffany: Yes, yes he does. Steve: And he does a fantastic job. So can you kind of break down what he did on that first Facebook Live, and how many people were actually watching first of all? Tiffany: Oh my goodness, I actually I don’t know how many were, because I wasn’t on the whole time. I’m guessing he probably had 50 to one 100 people, maybe even a little more. He had no idea what he was doing, he didn’t know the names of anything, I had just days before told him that I was even doing this. And he has a very outgoing friendly personality, and he just thought the whole thing was funny, and all these boxes show up at the door. And my son’s girlfriend knew what it was, but didn’t know a whole lot about it, and she happened to be there, and they start opening these boxes, and they were showing people this clothing, and people were saying, well when can we buy it. And my husband kept saying, well, when Tiffany gets back, and they were like, why can’t we buy it right now. And he’s like; well she wants to sell it, why not? So they start selling it, and they didn’t know the prices, people would say how much is it, they would say, oh I don’t know. But my husband would be like, it sure is pretty. People are saying, I want it, so they’re trying to write names down, it was crazy. And I mean it was just it’s so funny to go back and watch some of those videos, I mean it was just, it was so organic I think, and just so interesting and so probably just hilarious to people, that they just, I think they fell in love. Steve: I just want to take a moment to thank Kabbage for being a sponsor of the show. Now, if you run a successful e-commerce business like I do, you probably know that the worst thing that could happen to you is to run out of stock. Now, my wife and I regularly import container loads of merchandise from China, and sometimes you need a short term loan to buy enough inventory to meet demand especially during the holiday season. So it’s like an unboxing video, right? Is that how you would best describe it? Tiffany: If you could in any way describe it, I would call it that. Steve: Okay, because I’ve watched some of your latest videos, and it seems — Paul is awesome by the way, but if we can go back to that first video when he didn’t know what he was doing, can you kind of just describe like why it worked, or like what exactly he was doing that actually triggered all of these sales, or is it just — let me rephrase that question. Is it is it because like the product is just so popular that it sells itself, or do you think it was Paul in that first video? Tiffany: I think it was Paul. I think it was that my customers originally a lot of them didn’t really know much about LulaRoe, and as he was pulling stuff out of the box, I think it’s a combination of thinking it’s very interesting to purchase something like that online that way, almost like a life QVC where you’re interacting. And then the fact that I think there was probably some, what is this guy doing? And like just maybe even some of them, this guy is hilarious, like he has no clue what’s going on here. And we tease him every now and then, we’re like, well how many people felt bad for you, but he was I think just so genuinely trying to help these women find what their size was, and find something that they liked that I think that they kind of took that to heart. It was almost endearing that they thought, here is this guy trying to help me decide what to wear. I think it was just so different that they were just like, I’ll take it, I’ll give it a try. And so I think that that’s why it worked. Steve: I guess for anyone who’s listening, you guys have to just watch Paul in action. He’s actually really polished now; I was just kind of curious what happened that first day. You said he was on for six hours? Tiffany: He was, and back then you could only go what, like 45 minutes I think on live, maybe half an hour or 45 minutes to maybe an hour. So they were just restarting video after video when it would cut him off. I mean they knew nothing about Facebook Live, I mean they didn’t know it would even cut them off. None of it, I mean we really didn’t know anything about it. And they were trying to figure out just how to record the information, figure out who actually got what, how to sell it. I mean just how somebody can claim it; it was crazy just trying to figure out that process. Steve: So let’s talk about how you guys do it now, because it’s a lot more polished now, and you guys have your routines down. So can you just kind of walk through how you are able to move some of the sizes and the styles that aren’t that popular? Tiffany: Yeah, so I think what is key, and this is as much as we have this online businesses, online community, a lot of what has built that is we still do have open houses, and we’ll let people come try things on. There’s always going to be people who will buy something online, and there’s always those customers that won’t purchase it online until they can try it on or feel it or touch it. And so we do let them come in, try stuff on, we’ll have open houses, let them feel comfortable doing that. But in doing those open houses, I feel like myself and Paul have really gotten a grasp on how this clothing fits women. And beyond that, I think it just — and how it can make them feel good and make them feel confident, and make them feel beautiful. And so I feel like we try to make sure that that comes across, and comes across as genuine, that we want them to feel good about what they’re wearing. And so when Paul’s on, I mean he really pays attention to what they’re saying to him, even typing out what they’re typing to him. Is this woman tall or does she have broad shoulders? Maybe has she had some kids, is she trying to hide that weight in her stomach? What is going to fit her body the best? And I think for a lot of people I think it’s very interesting that a guy can pick up on that with just the things that you type out, not even seeing you in person. But that he’s telling you, try it, give it a try, post your pictures when you’re done, we want to see how this looks on you. And then quite honestly just getting it right, getting it right that this is what they need to be wearing, what style is going to fit on them best? And so as much as it is online, having that in-home experience where we get to know what does fit them is invaluable. Steve: So are most of your customers kind of local to your house then, or are they like all over the place? Tiffany: Oh no, they are all over the place, and they are enough that a lot of them have tried stuff on other places which we love with other consultants, and then they kind of come on because our show is very entertaining. And so they come on and I think they get wrapped up in the moment, and they’re like I’ve always wanted to try that, I know what to look at, so I’m going to go ahead and give it a shot, and then I’m going to go ahead and pick that one up. Steve: Okay, so let’s get to specifics, like what does Paul do, okay so you guys start live, what is the first thing that Paul does? Tiffany: We give it a second where we’re always talking to them calling them by name. So I think one of the most important things that you can do in a Facebook Live is recognition. You just have to recognize people, sometimes these people get on and it’s been days without someone actually saying their name. And so we make sure that we recognize them, and we’ll remember them. We ask how their kids are, we ask how their job interview was, we remember what sizes they wear. But we welcome them onto the show, we kind of give it a few minutes to get going, we’re playing music or we’re just we’re chatting with them, getting stuff arranged. And then typically we start with just — it’s a pretty random for us. We don’t necessarily tell them ahead of time what sizes or styles we’re doing; it’s really a free for all. And a lot of that is because Paul doesn’t know, he’s got such ADD and he’s all over the place. A plan for him would just put him under the table. Me I love to make all my outfits ahead of time, have them all in a rack ready to go. Paul just likes to grab stuff from boxes, and just keep everybody guessing as to what he’s going to do next. Steve: Okay so that implies – so you said a couple of things there. You remember their name, you remember their stories, does that imply that you kind of know all your customers, or do you have some sort of CRM system? Tiffany: No, we 100% it’s getting to know them, we truly get to know them, we truly try to, which it’s comes back to that basic community. They have a place where people recognize them, other customers get to know other customers, and they develop a friendship. It’s somewhere where they come, they can tell us about the job interview they had, or they did the job interview that we helped them pick something out to wear, they’ll let us know if they got the job and how it’s going, they talk to us about their kids, we find them stuff to wear before they have a baby and after they have a baby. Steve: Is this up another Facebook page or on the live itself? Tiffany: It happens in both. Steve: Okay but they can only text, all right; you guys have a video there only have text? Tiffany: Correct, and the great new feature where you can call somebody else in or invite them in, in video, we started doing that a lot. And so that is just still another better way that you can even connect with them face to face. Steve: Okay so in the very beginning like if we back up to his very first time on the Facebook Live, did he already know everyone from the group? Tiffany: No, he knew nobody. Steve: He knew nobody okay, so how did he make all those sales that first time then? Tiffany: I think that the first time I feel like that they were probably so fascinated about what was happening that it just happened. I think it’s one of those that people are probably going, can you believe this guy on here is trying to sell his wife’s LulaRoe stuff. But then with people asking to buy it, and I think everyone was just getting caught up in this moment of never having seen this before that they were just so interested, and they just wanted to purchase stuff. Steve: Okay, was he wearing — he doesn’t wear LulaRoe, does he? Do you have a male line? Tiffany: They have a couple male shirts, he will for fun and you know what, he kind of developed his own brand where he wears like a different unicorn shirt every night. So he’s got hundreds of unicorn shirts, but I mean it’s just you kind of develop your own thing. Steve: Okay, so how does the ordering work on Facebook Live, like how do you guys take orders? Tiffany: Well, so what happens is he holds something up; we give it a number so that we know what people are actually claiming. They comment and they put the number on there. That lets us know they’ve got that item. Once they have that item, we put the number and put it in a box, we’ve got a Google doc that we’re keeping live as it goes, we’re recording people get what. And then we go to our system that we have through LulaRoe, and we invoice them through their email. Steve: So what happens if you hold someone something up and like 20 people want it, does it go to the first person or? Tiffany: A lot of times it’s the first person, but then we do try to take in account that some people have faster internet, we can get nights where the same person can almost claim everything because they’re on super fast some kind of crazy internet. And so a lot of times we’ll do even what we call radio style, where we say, okay we’re going to take the fifth person that types in a number — and they type in these numbers, and so we’ll go more count off which I mean it gives people such anxiety. It’s actually kind of fun, because they are just sitting there going, I don’t know where my name is going to show up in this, but we count off five and we yell out the fifth person’s name and they’re the ones that get it. Steve: Okay, all right, this is just crazy to me because I can’t even imagine the audience that would be in suspense over shopping for clothing online. So maybe what would help me a little bit is like if you could help me understand the target demographic, and how you kind of – it sounds like you just naturally created this fanatical fan base through your page, and then live is just like a medium with which you ell, right? Tiffany: Yes, and that’s probably just a very — you say it very eloquently, that’s what it is. And the other part of it, I tease and I joke about it to my our customers and stuff, I’m like, I think there a lot of gamblers on here. But I think people more than anything they want to be entertained, we’re not just selling something to them, they’re there to be entertained and they’re there for a break, or they’re there because they know that somebody will recognize them. We have a lot of military wives who come on because they’re just alone at night, and it’s hard to go to bed with no noise, and sometimes they just want to hear a voice. We get it is just — it’s really kind of fascinating. So a lot of it is also just curiosity, and it’s a different way to shop, it’s something new, it’s something that they can do from home. You can be anywhere and just there’s a live video, and you can start watching. If you see something you like, you can purchase it. I think it’s just different, I think it’s exciting, I think it’s entertaining. Steve: It’s almost like an interactive infomercial? Tiffany: Yes, that’s a great way to describe it. Steve: Okay, and then — okay so let’s work to – sorry, it’s really hard to describe this to listeners without watching. So I’m actually going to probably post one underneath the video just to see Paul in action, because he’s actually really good. So he gets on, he starts talking to people, saying people by name, asking them questions that are pretty personal about how they are, the fact that he shows that he knows who they are, and then what does he do next? Does he just start holding up clothing? Tiffany: Correct, sometimes we’ll get a new box, almost say, oh my goodness, this is what came today, let’s open it up. We’ll open it, start pulling clothing out of bags and holding it up, telling him the size and style, letting him know how much it is, giving him an idea of what size it would fit. Steve: How does that work, like how can you tell what a person looks like? Tiffany: Well somebody types in, I’m 5’1, I’ve got really broad shoulders, it gives us an idea, okay maybe this longer waisted dress is not going to look good on them, maybe they need a shorter waist. Or if they’ll say, we get a lot — I mean it’s so funny, Paul will joke all the time, I have more women telling me their bra size. They’ll come on and they’ll say, I wear, this, this and this, and you’ll know right away, okay that dress, they’re not going to feel comfortable in that, it’s too tight across the chest. And so I think it’s getting to know the clothing well enough that you can guess what it’s going to look like on them, and try to help steer them in that direction because they are buying clothing that a lot of them have not tried on. And so you want to get it right, I mean we take clothing back, we have a return policy, we’ll exchange things for them, but we don’t want to have to do too much of that. So we try to get it right the first time. Steve: What’s funny about this is there’s like 300 or 400 people on watching you guys at any given time, like are you giving like one-on-one service on this live? Tiffany: We don’t as much. Some nights we will, and like you said, no sometimes that traffic will drop; it gives us a little time to come on and be more personal with each individual person. We also, something that we do that’s not live is I will come on and I will take some personal styling requests, I will go make them outfits, and then I will take a picture and post it to the wall in my group, and say, this outfit was made for and give their name, and then let them have the opportunity to say, I want that or I don’t, and then pass it to the next person. Steve: Okay, sorry I keep interrupting. So you get up and you have whole articles of clothing up, sometimes you get through with some of the people and get their sizing. And then what, is it just like that for like two or three hours? Tiffany: It is, it totally is, but you have to be smart about it. If you can see that people aren’t interested in something, that style is just not what’s clicking with them that night, we will quickly change to something else. So we can tell that tonight, those smalls and those extra smalls, people are snapping those up, we will change and go and pull those sizes specifically. So we do try to pay attention to what’s going on, and try to kind of in a way I’ll say cater to that, because we don’t necessarily take requests individually. If you can imagine if you had 400 women on all requesting you to show them something at the same time, you’re not going to please anybody. And so instead of doing it that way and making 399 people unhappy, we kind of just show everything and let everybody have the chance to — there’s going to be something for them. Steve: Okay so what do you do about like stuff you can’t sell? Tiffany: So far I’m going to tell you so far we have not had something that we can’t sell. Something will stay a little bit longer, a lot of consultants have a strategy too to where if you’ve got something that stay a little while, we’ll style it a different way, we’ll show it worn a different way, we’ll put it with another piece to show them how they can actually wear it, and then if it comes down to where you really feel like my customers just aren’t connecting with this piece or this pattern, within consultants, we’ll swap clothing with each other. So maybe I’ve had this dress for a while, my customers just aren’t interested in it, I’m in Texas, this pattern is not appealing as much here, but I might trade with another consultant, I might ship it to her, she might ship me something. Or a lot of consultants will get together, and have a swap where they will swap inventory just to freshen things up a little bit. Steve: Okay, but for the most part like even like your extra small sizes still manage to sell? Tiffany: They sure do. I mean it’s crazy. Steve: No it’s so different Steve and I think that this is what was so attractive to me in the beginning was it’s something that was so different, and then the way that it was done where you could never choose your style or pattern when you ordered, it was really kind of eye opening that it was a way to keep it exciting and in demand. Steve: So let me ask you this Tiffany, I mean you’ve had a lot of success selling LulaRoe clothing using this method, do you think that this method could apply to just general e-commerce stores, like if you were to sew like your own widgets, and I know in the past you had thought about starting an ecommerce store, would you go with this strategy, and how would you go about doing it? Tiffany: You know what Steve I would, and you’re seeing it more and more. When I’m scrolling through my feed, I’m seeing people selling baby blankets online live, I’m seeing people selling makeup, I’m seeing people selling jewelry live now. I 100% just think this is kind of where it’s going in a way. I think that you should be showing everything that you’re selling; I think you should be showing it live, and I think you would be surprised at how many people would say, can I purchase that when you weren’t even intending to sell it. Steve: Okay, so let’s say I — so we actually do have this older demographic that really are into handkerchiefs. So let’s say that I want to be going on Facebook Live heaven forbid, and I want to try selling these, like what — if you can give me some tips on how to actually hold this live, that’ll be great, like what are some must have things that I should be doing? Tiffany: Okay so first I think if you have a little bit of an older demographic and you’re a man and you’re selling handkerchiefs, I think they’re going to fall in love with you. And I really do, I think they’re going to just think, how does this guy know his stuff, and he’s explaining these handkerchiefs, and he is using terminology that he clearly knows what he’s talking about. They’re going to be confident in you, and part of this is falling in love with you, especially because with video you’re making such a connection that you don’t make when you’re buying just in an online store with no visual of who is selling it to you. And I feel like in a market where a lot of things are a little bit saturated, or they can get a handkerchief anywhere, I mean I know yours are unique, but I mean if you can get that stuff in a lot of different places, why do I want to buy from Steve? If I see Steve on video and I see his personality and I fall in love with his family, and I think he’s adorable, I will buy from him before I will buy from anybody else, and I will be loyal to that. I think if you were to do something like that, I think it’s fun, just a cool set up, good lighting, knowing what you’re talking about, and just a lot of different samples and things for them to purchase, and then an easy way for them to be able to purchase it is really interesting. Steve: I just want to take a moment to tell you about a free resource that I offer on my website that you may not be aware of. If you’re interested in starting your own online store, I put together a comprehensive six-day mini course on how to get started in e-commerce that you should all check out. It contains both video and text based tutorials that go over the entire process of finding products to sell all the way to getting your first sales online. Now this course is free and can be obtained at mywifequitherjob.com/free. Just sign up right there on the front page via e-mail, and I’ll send you the course right away. Once again that’s mywifequitherjob.com/free, now back to the show. Actually that’s a good point because come to think of it, my mom is on QVC all the time, and she buys stuff like every day. It is this infomercial site, except you’re taking it one step further, and you actually know the customers on a personal level. Can we talk a little bit about some of the things that Paul does in particular that some of your customers like about his personally, or some quirky things that he does on a live video? Tiffany: It’s a lot of quirky things Steve. I think that they love — it’s very interesting, and I found this is in the blogging world as well. As a female blogger in coupons, what I could get away with as compared to what — so now Paul’s a blogger as well about coupons, he has a different site than I do, what Paul can get away with is a lot different than me. So if I did something wrong I would have a lot of hate mail and people coming at me. If Paul does something wrong, it’s more, hey Paul sweetie, I’m not sure if you realized. They’re very different with men than they are with women especially when you’re — we’re selling to 95% women online. We have a lot of husbands are watchers, but we are, and so Paul can get away with things that I can’t that would make me look mea, or would make me look too firm. But he can say, you must pay your invoice in the next twelve hours or I put your stuff back. If I say it the same way he says it, all of a sudden they don’t like me. But for him they don’t question it at all. So there are some things about being a man that especially in the demographic that we have that does work that way, that he’s allowed to do something that I’m not. But some of the things he does, he’s got certain songs that they know that they come on in their dance break, and he’s yelling at everybody to get up and dance, and he’s dancing and totally crazy. He wears his unicorn shirts, he always has had on backwards, and that’s something he’s done with his with his blog as well, it’s kind of his brand, they’re all surprised to see that he has hair, just things like they just that they get to know him, they know what to expect from him every time, so that it’s also comfortable for them. Steve: So does that kind of imply that like a guy might be better at selling women’s products than a woman? Tiffany: I don’t think all the time, I mean there are some products I don’t want a man to sell me, but I think that there’s some stuff that if they’re knowledgeable, and I’ve done a lot of different things. I also — this just shows I’ve done, I’m old now, I’ve done tons of things, but I also was a hairstylist. No matter how bad the men hairstylist were in our salon, women always wanted them to cut their hair because you want that acknowledgement from men I think. It’s a very weird, it’s just a very — women want men to tell them that they look nice, that this is going to look good on you, that you look amazing in that dress, you want to hear that. When women say it to other women, a lot of times they doubt that you’re sincere which is a shame. They feel like you’re not being maybe sincere to them. If you hear it from a man, you’re kind of pretty sure that they didn’t have to say that, and they definitely don’t always go out of their way to say it. So they’re probably — you’re thinking it’s probably true, and it is I mean you don’t lie to anybody about anything, but it’s the way that it’s coming across to them, women like to have I think men help them find something to wear. I think they think it’s very interesting, and it makes them feel good. Steve: That is really interesting what you just said there. So that’s the reason why you have Paul do the most of the selling, like I don’t think I saw you when I watched that one live with you guys? Tiffany: I’m often a lot of — so it works really well for us. So I’ve seen a lot of men try to do what Paul does, and it comes across in ways insincere from them, because they’re not doing their own thing. They’re trying to do something that somebody else has already done, they’re trying to be someone that they’re not. If they come on and they’re just genuine and they are who they are, they don’t try to be crazy like he is, because he just is that way, then if it’s genuine people get that. If they’re trying to be something they’re not, you get that as well. And so it just happened, it just works good. So I’m on often during the day, I do a lot of the kids’ stuff, I sell a lot of the kids things during the day, because I feel like it kind of comes across, I’m a mom, we’ve got seven children. I can tell you how this stuff’s going to fit your child. A lot of women, they like to buy the kids’ clothes from me. So that’s how it’s worked for us. Now you’ve got a lot of businesses where the husband although he might be full time LulaRoe, he doesn’t go on video at all. His wife is the one who’s selling. It just for us happened, I mean Paul was never part of this plan for us, he was never part of this, he was not supposed to be involved at all, and now he does our live. So that original business plan I have Steve has I mean no as being on it. We have actually done, it just it completely flew out the window the very first day. But it just evolved into what it is now. Steve: I’m just curious, have you guys tried to sell anything outside of LulaRoe, like it seems like everyone loves Paul, everyone loves you, and so at this point it almost seems like you could get away with selling anything. Tiffany: You know what, and we have that talk a lot and I believe we could, I believe we could. I think that we — I mean we know how to build communities just from our experience blogging for so many years, and in running coupon classes and online communities for all that. We have sold out things, we had coupon binders that we designed ourselves, we had them made, we sold those along with our classes and stuff. So we have done some of that, we talk about it all the time. I really believe that this is a way that anyone can do anything to create this community around this niche and around a certain demographic. They get to know you, they get to know why you love it, why you’re passionate about it, and if they’re going to purchase it anyway, they might as well purchase it from you. Steve: Can we talk a little bit about how to build your community on like a Facebook page because you’re not going to have video per se, right; you said you were just posting images in the beginning. Can you talk about some of things that you did early on to build that page? Tiffany: I make sure that I respond to everybody, whether or not it’s liking or it’s commenting or telling them thank you or amen, or just whatever funny little comment to them, always acknowledging them. I love to encourage them to post pictures of themselves, and it’s just that personal acknowledgement and making them feel like if they need something, I’m solving a problem for them. Or I am like them; I’m still trying to figure out what to make for dinner tonight. I’ve got to keep my kids up from 10,000 places. So I think it’s just it’s really just that that kind of basic community stuff. Steve: Does that mean that you don’t use any auto posting, like everything is just you personally doing it? Tiffany: You know sometimes I did for example in January, we did a fitness challenge. I went in and I did schedule out, every day we had a check in, and then at night we had a check in. I scheduled that stuff just to make sure it was posted at the same time every day, but I [inaudible 00:46:26] post a lot of stuff just organically, and right now we have so many of our readers and our customers posting that often I can’t get a word in. Steve: Okay that’s great. So how many people did you have on your page before you started — before Paul did this first live that sold everything out? Tiffany: We’re trying to look back, I wish we could get that like that timeline from Facebook of how many people you had when, but I think we had about 1,200 people when we did that launch. Steve: Okay, not a huge page. Tiffany: No it wasn’t at all. Steve: Did you buy any likes or do you ever spend money on ads or anything? Steve: Wow, okay this is completely organic? Tiffany: I know. It is wild; it’s a little bit wild. Steve: Can you just give the listeners an idea of like a typical nightly haul, like when Paul gets on, like how many do you sell? Tiffany: You know what; we actually have a goal of selling 100 items every night. And so it’s we kind of — on our Google doc, we’re recording who purchased white, we have a good eye, we can kind of tell how many items we sold. There’s times when he’ll just keep going because it was a pretty slow night, and we just had that goal that we’re doing. Steve: Okay I see, so you just keep going basically until you’ve sold those 100 items? Steve: And I’m just curious, and this is just out of my own curiosity, are you taking orders still via like a Google doc, and then entering stuff in? I’m just kind of curious how come you’ve chosen not to use like an e-commerce platform for that? Tiffany: Actually in our terms and conditions we’re not allowed to, so we can’t have a separate checkout cart system of any kind, we have to invoice through their program. So we’re a little bit limited on some of that. What we’ll do if we have a big cap to launch like Halloween or 4th of July or Valentine’s Day, we will do like a pre-sell and let people just blindly order, I just want this many pairs of leggings, and just to make sure they can get something, maybe they don’t want to sit on a live sale and wait till we show leggings. So we’ll let them kind of preorder that, we’ll invoice them, they pay for it, and then when it gets — as soon as it gets here, we just automatically ship it out to them. Steve: So you have to enter everything into LulaRoe system and then LulaRoe invoices the person? Tiffany: Well we’re entering what they’ve got, we send that invoice out, but they’re paying through LulaRoe system yes. Steve: Okay got it right, so you never actually touch the money? Steve: LulaRoe gets money, then they pay you? Steve: Okay, interesting. Wow, oh okay so let’s conclude this interview by asking you if anyone wants to kind of apply your principles to their own e-commerce store, what would you say would be the most concrete steps to get started doing this? So you need a Facebook page obviously right? Tiffany: Actually we’re doing for the longest time just user group, we just used a Facebook group. Actually like you can build a little more tight knit community now. I know that a lot of people are more familiar with pages, I feel like we’ve kind of developed this in our groups. We also have the ability in the groups to create those albums and even post pictures and albums, and even use albums a little bit like forums which was something I’d never seen before. And that was also a draw to me, I just saw, I had never seen people using groups like they were. So we do most of ours in a group, a Facebook group. I know I have my page, but that’s mostly just that’s kind of a way to if I want to run an ad, at some point if I want to do all that kind of stuff, that’s kind of my business card, but my group is where it really all happens. And some of the reason for that is ours has gotten so large, ours was closed, we can’t change it back. But it also makes some of our customers feel really secure when they’re like sharing their sizes and things like this, they’re more comfortable doing that in that closed atmosphere. But we started in a group and so if people were to do that and they just — you were to build that community like you’re taught to build a community and to grow that with people within that same niche, if you show them yourself and you show them on video who you are and they get to know you, that is what is going to sell your product. Steve: Can you talk about the distinction between a page and a group in terms of how you use it? Tiffany: So your Facebook page is that kind of open business card that the whole world can see. It’s amazing for running ads, for boosting your posts, for sharing content. The group is a situation where it makes me kind of when I’m thinking about it, I think about it as a more like you’re having everyone over in your living room. And I feel like it gives them the opportunity to interact and comment more where they can post their own pictures and things which is important for our business, that they can show us what they’re doing within that. And so that’s why we do that. Steve: Okay and then do you keep the group open, or do you have to approve every one that comes in? Tiffany: We actually now have to approve every one. Even if your group is public, in order for them to comment, you still have to approve them. If it’s public, they can still watch a video, but to comment they still have to be approved into a group. Steve: Okay and then to get that initial group of people, you mentioned that you started with friends, was it just completely organic from there like friends who were following friends? Tiffany: It totally was, I did that one giveaway for those leggings in the beginning which you could always do that, but you risk getting people added in that really didn’t want to be there. Steve: I see, and is there a problem with adding people that didn’t necessarily want to be there, they’d just be dead people, would that be a problem? Tiffany: They are in your group, and they kind of pull that group’s weight down. And so you don’t necessarily want to have that happen. You could do, I’ve seen people do where they do a best friend give away, or you should only add your best friend or only add someone who loves LulaRoe, only add somebody who loves this product. Steve: Okay, do you ever go in and clear out members who aren’t active? Tiffany: A little bit. I haven’t taken the time, I think about every day, it’s on my list of stuff to do, but I mean definitely something I want to do. Steve: So the idea there just to kind of summarize then is that you don’t want dead weight there because it brings the visibility of the group down on their feet, is that accurate? Tiffany: And that’s correct, and the thing is if you have a very interactive group, you don’t have to have a lot of people in there. So for example we’ve got neighbors that sell LulaRoe, they have about 3,000 people in their group, and they do well over $60,000 a month. So it’s not about necessarily the size of the group that you have, it’s really about how that community is interacting with you, and what really they’ll purchase. Steve: Okay, and in terms of your page versus your group, you spend most of your time in the group and not the page, is that right? Steve: Okay, and the page you just kind of post, do you post like your personal stuff on your page as well? Tiffany: I do a little bit and I also I mean that’s more why we have things scheduled on my page. I will schedule stuff on my page, I’ll actually have a post from Instagram to my page, and so I kind of have that linked that way, and I’ll create events and things on the page telling them what’s happening in the group. Steve: Okay, I’m just trying to figure out like what purpose the page is at this point, it sounds like most of the business comes from the group, is the page like a conduit to your group? Tiffany: In a way, so it also goes back to me just being in my background just being a blogger knowing I have to have a page, you can’t and it’s funny because you’re like you just feel like you’ve got to have that. We have a couple times gone live on our page, and shared that into our group. The problem with going live on the page is it is so open to everybody. We have a real high percentage of non pays when you do it on your page, because they don’t understand how it works. You’re doing a lot of re-explaining. We typically only have about anywhere from three to five percent who don’t pay when we go live on our page, because so many new people and they don’t understand. We’ll have about a 10 to 15%. Steve: Oh okay. And so the penalty for not paying in the group is you get kicked out of the group? Tiffany: They do, they get two chances, and they’re kicked out. Steve: But on the page you can’t really do that? Tiffany: You can’t, no you can’t. Steve: Got it, okay interesting. Well, Tiffany this interview was eye opening to me. I just can’t imagine being able to sell millions of dollars of product in an infomercial type environment on Facebook Live. And I do know that LulaRoe is an MLM type of thing. It seems like you make most of your money doing a lot of sales as opposed to depending on your down line? Tiffany: Yes, exactly and that’s what was attractive to us. Steve: Okay and then you could take this method and let’s say you decide to sell your own brand or your own line some day, you could just take this method that you’ve used, and then sell your own products that way as well and keep all the profit? Steve: Okay, crazy, crazy. Well for the listeners out there, I’m going to try to post one of Paul’s live, you guys really have to just check this out, it’s crazy. I think he even like rings a cow bell at times right? Tiffany: Exactly, it’s so funny Steve it’s back to that recognition. Steve: Yeah so they ring this cow bell and it’s some like daily deal, or I can’t remember what he does. Tiffany: It’s your first purchase, your first purchase for this, you get the cowbell, and I mean your readers will be like, oh my gosh you forgot Michelle’s cowbell, it’s crazy, they get there and do it. Steve: Yeah and then people are nuts over this. You just have to see it to believe it. Well Tiffany I really appreciate your time and coming on. I learned a lot and I’m sure the listeners will get a lot out of this, because a lot of people aren’t selling this way right now, and it sounds like it’s an amazing way to sell, and it converts really well. Steve: Well Tiffany, thanks a lot. Hope you enjoyed that episode. Tiffany and Paul are one of the very few people I know who sell physical products via Facebook live, and you really have to watch them in action to believe it. It’s actually crazy. For more information about this episode, go to mywifequitherjob.com/episode182. Now, I also want to thank SellerLabs.com. Their tool Scope has completely changed the way I choose keywords for both my Amazon listings and my Amazon advertising campaigns. Instead of making random guesses, Scope tells me exactly which keywords are generating sales, and within the first week of use I saw a 39% increase in sales. It is a no brainer. So head on over to Sellerlabs.com/wife and sign up for free. And if you love the tool you will receive $50 off. Once again that’s sellerlabs.com/wife. And if you’re interested in starting your own ecommerce store, head on over to mywifequitherjob.com and sign up for my free six day mini course. Just type in your email and I’ll send the course right away. Thanks for listening. There is a podcast on your website about a guy who sells on Amazon (I think) but sources his products from American manufacturers only. And there is another podcast about importing from China but this person uses only air-freight. Would you be able to tell me under which episodes would these be located? Thanks. Steve, when I heard Tiffany said that her husband Paul can get away with certain actions that she can’t, it shows a lot of sexism. There should be no reason that Tiffany should be treated differently from Paul just because she’s a woman. I think she’s just talking about reality. I looked into this after listening- apparently LuLaRoe is facing lawsuits alleging they’re running a pyramid scheme.